Refill your bingo chip collection with these 100 count green magnetic chips. Using magnetic chips with a wand makes picking up chips a breeze. Clear your card faster. A wand will normally pick up about 100 chips at the same time. Choose your favorite color (red, blue, pink, purple, green) to bring you good luck in your bingo game. Chips are packaged in a resealable bag to make storage convenient. Each is UPC coded. Not recommended for children under the age of 3 years. It’s Glue is used to glue multiple paper sheets together. Can be used to glue Bingo cards together. Can be used for arts and crafts. Suitable for paper, cloth, and pictures. Dries fast, non-flammable, and non-toxic. Each tube has over 1.50 ounces of glue in a clear bottle. The glue bottle is UPC labeled with 3 dozen bottles (pens) packaged in a display box. Not recommended for children under the age of 3 years. 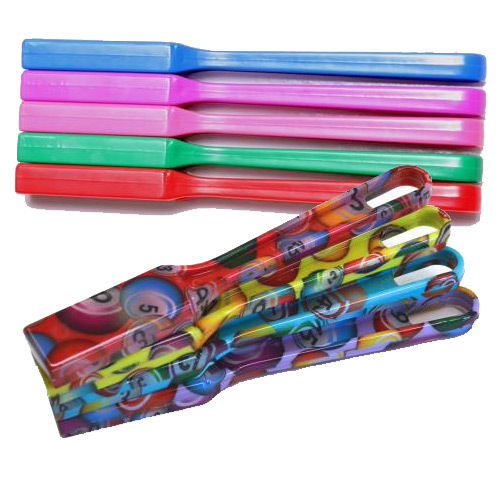 Magnetic bingo wands make picking up chips a breeze. No dropping chips on the floor with this strong magnetic wand. Quickly clear your card and pick up 100 chips at once. Choose your favorite color or design to bring you good luck in your bingo game. Each wand is UPC coded. Wand measures 7.5 inches long.